TWO cheques were presented by Presentation Secondary Tralee students this week to Cuan Mhuire and the Irish Cancer Society. 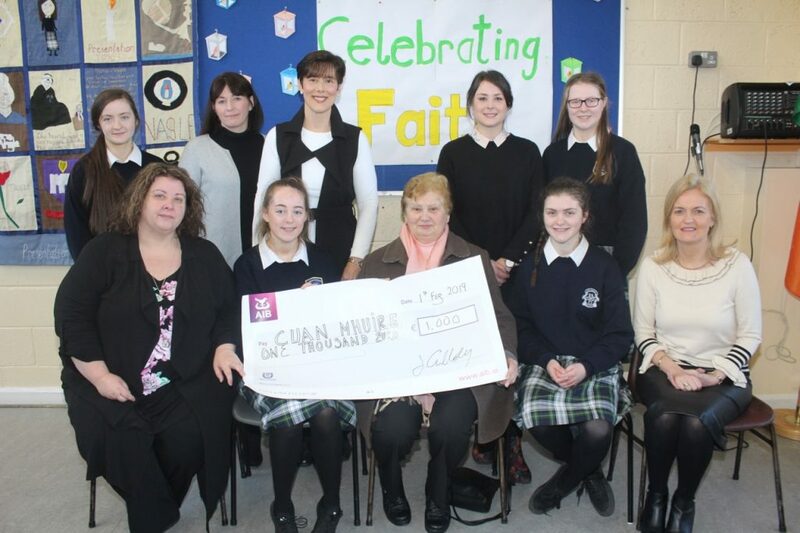 Transition Year Students from Presentation Secondary School Tralee presented a cheque for €1000 to former Principal Sr Brid Clifford in aid of Cuan Mhuire, which is Ireland’s largest voluntary provider of Rehabilitation Treatment for individuals suffering from addiction and other related issues. Earlier in the week, the Leaving Certificate students presented a cheque for €440 to Micheál Ó Cinnéide on behalf of the Irish Cancer Society. The students hold a fundraising sleepover every year and the ICS was the chosen beneficiary this year. Presentation Leaving Cert students present a cheque of €440 to Micheál Ó Cinnéide of the Irish Cancer Society. The presentations coincided with Catholic Schools Week which was co-ordinated by the Transition Year students as part of their Faith Alive-Faith in Action TY RE programme.